Though he probably never lived here, one of America’s leading creators of the skyscraper is spending eternity in Ridgefield — practically next to another skyscraper architect. 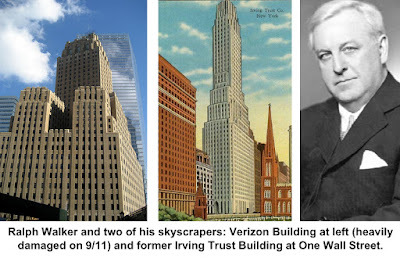 Walker designed many of the major art deco skyscrapers in Manhattan, including the Barclay-Vesey Telephone Building (lately called the Verizon Building, heavily damaged on Sept. 11, 2001), the Irving Trust Building, the Western Union Building, the Salvation Army Headquarters, and the Walker Tower. Gold Medal of Honor, for his extraordinary service to architecture. 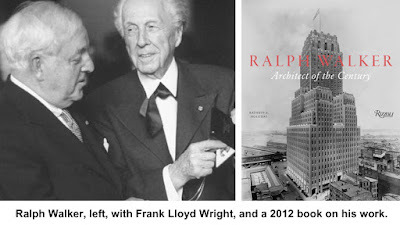 In covering the award, The Times dubbed him the "architect of the century." Born in 1889 in Waterbury, Walker apprenticed at $1 a week under a Providence, R.I., architect while studying at MIT (in his third year of apprenticeship, he got $3 a week). During World War I, he was a lieutenant in the camouflage section of the Army Corps of Engineers; the unit created sometimes elaborate ways of hiding arms and materiel from the Germans, often using painted fabric. After the war, he moved to New York where he began designing many tall buildings in cities in the Northeast, was closely involved in the design of the 1939 New York World’s Fair, and became a partner in a major architectural firm that still exists today as HLW International. So what are his mortal remains doing in Ridgefield, a town in which he probably never lived? Ridgefield was the home, late in their lives, of his parents, Thomas and Marion Shipley Walker, who lived at what is now 83 West Lane, just northeast of the junction of Olmstead Lane. Since Thomas was a construction worker of modest means, Ralph may have bought the house for his parents. Ralph probably visited his folks here and may have stayed at their house for periods of time. But his home from the 1930s until his death was in Chappaqua, N.Y. The Walkers moved here around 1930. 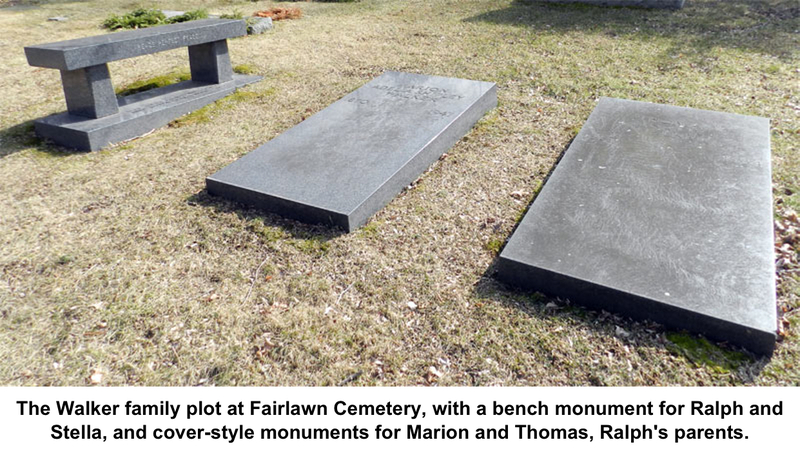 The couple purchased a “family plot” in Fairview Cemetery on North Salem Road, where both are buried. Thomas died in 1934, Marion in 1947. Three years after being so highly honored by the AIA, Ralph Walker quit the organization after the AIA charged that a member of his firm stole a contract from another architect. While Walker was found to be completely without fault in the case and eventually rejoined the AIA, he destroyed his Medal of Honor in anger over the incident. Meanwhile, his wife, Stella, was committed to a sanitorium; she died in July 1972. Within months, Walker married Christine Foulds, a widow from England. However, not long afterward, on Jan. 17, 1973, Walker placed a silver bullet into a pistol and shot himself. 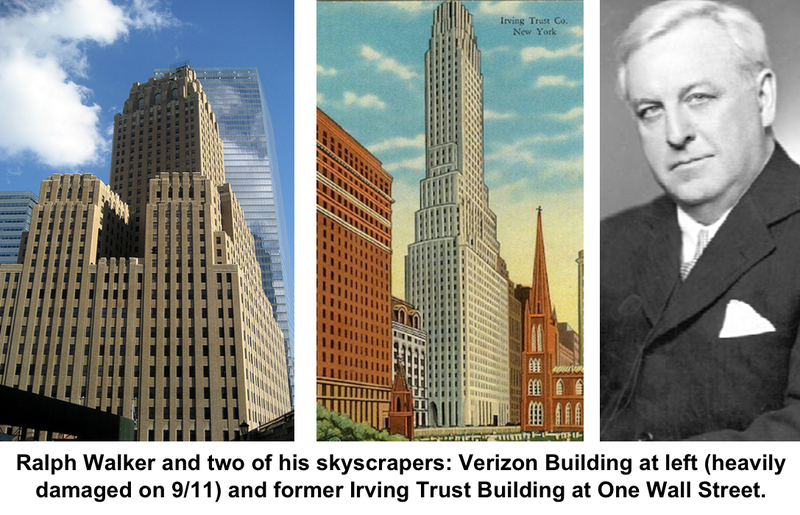 One wonders whether Walker, in planning for his death, chose to be buried with his parents, not only for family reasons but also because a few dozen feet away, in the same cemetery, is the grave of another master of the 20th Century building design: Cass Gilbert. Thus, a relatively tiny, rural cemetery, containing about 625 graves, holds the remains of two of the 20th century’s greatest architects.